This is my first attempt at getting a Zentangle pattern accepted at the tanglepatterns.com website. Wow! Great work! And a great story. Hope you are all recovered and feeling well now. Wow! Great work! Love the way you put the patterns together. And a great story. Hope you are feeling well, now. Thanks Connie. I am feeling well. Zentangle really helps me to be more focused and balanced. Great job on PAX loved doing this. Thanks! I’m glad you liked Pax. I would love to see what you’ve done with it! I love your tangle and I love the soft lines and the way you can take it where ever you want to go thanks so much for sharing it with all of us! I love it Can’t wait to tangle! Love Pax! Can hardly wait to get busy with a tile. Lately I haven’t been liking the new patterns much – but this one is awesome. Thanks. a wonderful new tangle, a delightful name and your story is a true inspiration! we loved Paris, still have not seen Hawaii, but are looking forward to tulips in Amsterdam in late April…..maybe I will find a tangle in the lush gardens! Pax is a winner. I found it very relaxing to execute and love the two samplers. Beautiful pattern! I hope you are feeling better. I just visited my daughter in Kansas as she has been sick with stomach cancer. I have given her some Zentangle supplies and a book and I hope that she will take an interest in it as it is so relaxing. I look forward to trying your new pattern. Thank you for sharing. Really like this – I’d like to feature it in my book that I am writing. Is that okay? I read your story and was very impressed and admire your way of living. Luv, luv, luv this tangle. It is so soft and fluid. Can’t wait to try it. As with most found this new art form quite by accident and fell in love instantly. Hope all is going well with your health. My prayers are with you and your family. Keep up the beautiful work. Isn’t Zentangle great! I too find it takes me “out of myself” and stills all the noise in my monkey mind. Love your pattern. I am especially fond of anything “Cadent-ish” and this pattern, kind of lacy, kind of ribbony, kind of delight-inspiring, is just the ticket. Hope you are mending faster every day. 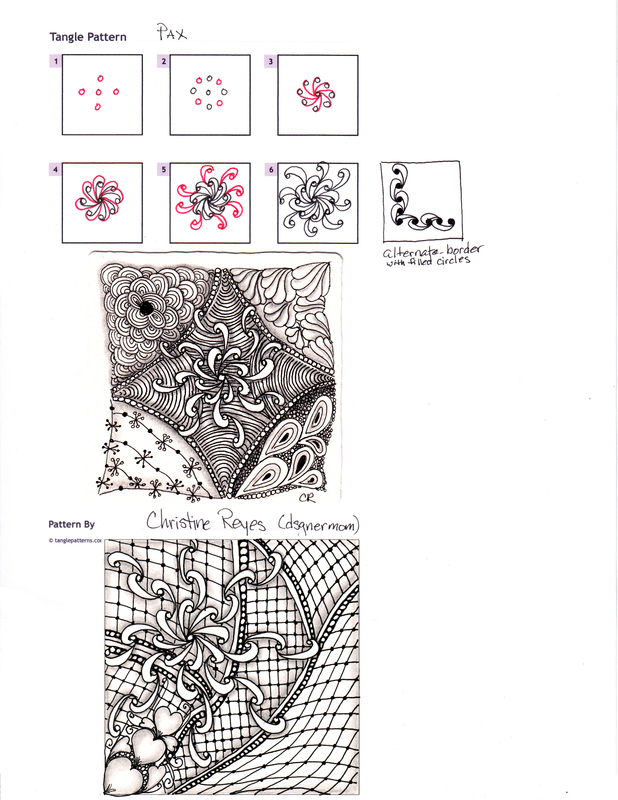 I love this tangle and your story leading up to your discovery of Zentangle. These are my favorite types of tangles because they take me out of the “grid” and turn me loose in a different direction. I send you love, peace and joy as you continue your journey. I love Pax. Thank you for sharing the story behind it. I’ve come to love Zentangle while in hospital as well. Your designs inspire me. Beautiful. Hope you’re stronger everyday! Hi. What a wonderful pattern you have made! I also learned Zentangle during a hospital stay. I have Multiple Myeloma (cancer in the bone marrow). It is incurable, but I had 2 stem cell transplants for a clinical trial, in hopes that it would help me keep it at bay. So far, it has! Meanwhile, I have been doing Zentangle (self taught) since 2012. I took a class in 2013 and it opened up a whole new world of Zentangle. I am now a CZT and loving it! I started out doing it as a way to ease pain. Now, I found that I am able to focus better, especially after all of the chemo I have had! Thanks for the new tangle. I plan on using it very soon! Good luck to you. Thanks for the great story and the neat tangle. I hope to become a CZT by the end of this year. Zentangle has really help with my inner spirit! Love it. Can’t wait to see how it works its way into something I’m doing but it won’t be long, I’m sure. Good luck with your recovery. I have been experimenting lately with spirals that follow the fibonacci series…such as you might find in the center of a daisy, or around a pine cone, or in cauliflower, and in many other places in nature. Step three of this tangle is just exactly where I start my fractal’ish spirals, and I can hardly wait to play with this tangle. Looks fascinating and fun! Is it o.k. to copy patterns and send as personal cards (not published. I love the zentangeling, but I am not necessarily crerative to put them together. Of course they would all have my "twist" on them.